Craft a gorgeous and profitable brand that you love. Social media marketing is time consuming. We know this, and that’s why we’re so passionate about creating beautiful styled stock photos that you can post on your social feeds… and anywhere else. We offer convenient subscription options so you can just log in, download the images you like, and schedule or post them on your practice’s Facebook, Instagram, Twitter, and LinkedIn pages. You can even use them on your website, blog, or printed materials! Gorgeous styled workspaces in every color scheme to fit your brand. At Soiree, we are all about treating yourself! So naturally, we had to add fun photos of our favorite sweets and treats. Our seasonal stock photos are perfect for keeping your marketing up to date! Spring, Summer, Fall, and Winter photos are constantly being updated. A large variety of lifestyle photography available for use on your blog, social and marketing graphics. We saw a huge need for dental photography that disrupted the norm. Finally fresh images that represent your brand and attract your tribe! Perfect for blog posts, Instagram, and using throughout your site. Constantly updated monthly with new and fun sayings! We are now including the Soiree Social Bundle in all Soiree Stock memberships! As a paid member, you’ll get access to 30 engaging captions and 30 researched and relevant hashtag sets every. single. month. Use the suggested paired images or match the captions up with your favorite image from our library and post away on Facebook and Instagram! You’ll also gain access to our library of video tutorials and a private Facebook community to ask questions, share wins, and grow your social media marketing strategy for a profitable ROI. The Soiree Stock membership is designed to help you grow your business, show off your brand, and give you back the time you need to do what you do BEST. We professionally style, shoot, and edit all of our photography in our creative studio to fill our Soiree Stock library with ready-to-go square images. All you have to do is download the images you’d like and start posting away! 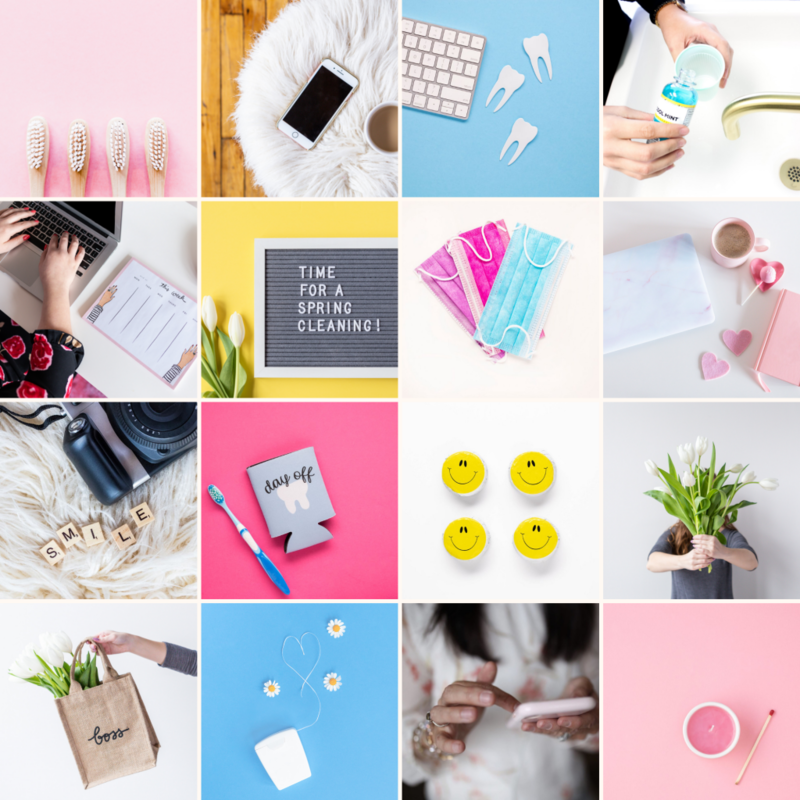 Dentists, you can say goodbye to struggling with stale stock photos and hello to our gorgeous styled stock photography, curated for busy business owners just like you. Grow your business, increase your income, and spend more time doing the things you love. Reserve your Soiree Stock membership today.